Cal Winslow explores the bitter healthcare workers' fight in California. One of the many positive aspects of working at The Chicago Reporter is collaborating and learning from the interns. We’ve had interns who have gone on to run marathons, blog for ProPublica, and attend law school. But we’ve never, to my knowledge, had an intern who had a book dedicated to her. 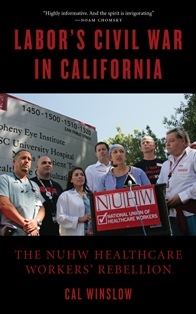 Samantha Winslow is a former health care organizer and the person to whom her father, historian Cal Winslow, dedicated the engaging and entertaining work, Labor’s Civil War in California: The NUHW Healthcare Workers’ Rebellion.